Most people are afraid or embarrassed to interact with someone in a wheelchair or on crutches, and I think this is common for two reasons. First, many people have not had the opportunity to interact much with disabled people. That’s the primary reason anyone feels awkward or nervous around someone from a minority group. The second reason is a scenario I see very often and it is almost tragic. In an effort to be polite, most people will teach their kids to not bother any disabled people they meet. Let’s say for example that I am at the grocery store checkout next to a mother and her son. He is naturally curious about my Mobilegs and will look at me quite openly, trying to figure out why I am different. Often a kid in his position will ask the obvious question. At this point, the normal reaction of the mother is to turn beet red, scold her son for being rude, apologize to me, and drag her son away. I feel really bad for the parent in this situation since they are only trying to be polite — and are probably just doing the same thing their parents told them. Unfortunately, this doesn’t teach the child to be polite. This teaches the child that a disabled person is scary, different, and shouldn’t be approached. It is true that nobody likes to be stared at, and when I was young I used to be embarrassed. Think of what it might feel like for a mother to tell her son not to stare at you. Wouldn’t you start feeling different and wishing people wouldn’t approach you, either? The best solution for this that I have seen is for the parent to allow the child to look and ask their question, then to answer calmly. Even if you feel weird, just pretend that everything is normal — and it will be. 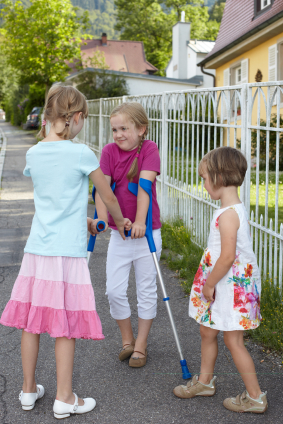 I love it when the parent suggests to the child that maybe they could ask me politely why I am on crutches. This has the added benefit of giving the child full permission to interact with me, and to become comfortable with speaking to someone different. I am always sure to take the question seriously and to give an honest answer, even if it’s just as simple as “I get sore sometimes and these help me get around.” When a parent responds instead of overreacting, he or she will help the child and the disabled person so much more than if they simply tried to be “polite” in the first place. Lindsey Carmichael is a two-time Paralympic archer and Mobilegs user. Just would like to say thank you for a very positive, very helpful blog. My children and I were at the beach two weeks ago and as we queued for ice cream the gentleman in front of us has an artifical leg. Both my children reacted by staring at the man and his leg, and to my horror shouted 'Mummy look! He's a robot!' I was mortified and did not know how to deal with it! Amidst the panic and shame, I told my children, as calmly as i could at the time, 'That is one special leg, he must be really brave to have that on.' And then he turned to look at me and my children, so I smiled and said 'Hello, how are you doing? I'm really sorry, but my children are just curious, please don't be offended.' The gentleman smiled at us and that was it! And eversince I just kept having that moment repeated over and over in my head, thinking did I do the right thing? Did I say the right thing? I suddenly realised that I am so not prepared for this type of scenario! So I googled and found this blog and now I can breathe a sigh of relief once more, because now I know. Thank you!